My name is Richard Bass, Magician and Childrens‚ Entertainer since 2010. Performing and entertaining has always been a passion of mine... from dancing like-a-loony‚ on stage for Butlin's, to teaching drama to fantastically enthusiastic children ( 4 - 18 years of age) at a local theatre, all the way to making innocent bystanders scratch their heads in disbelief through street and event entertainment. Matthew has won the highest award in the UK for Close Up Magic, and is The Magic Circle Close-Up Magician for The Year 2010. He regularly performs at Weddings, Close up magic, Table magic etc. He has appeared on BBC, ITV, Channel 4, Sky and Cable and has performed all over the world and has worked for venues such as The 7 Star Burj Al Arab Hotel in Dubai, and The Ritz. 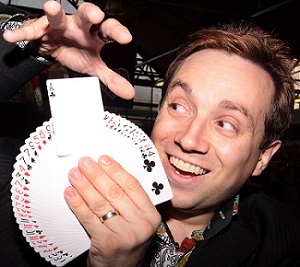 Steve performs unforgettable close up magic that will leave guests stunned and wanting more. He has performed on a British Cruise Ship, for The Armed Forces and has many large corporate contracts. Whatever the occasion whether it be a small garden party, wedding, special event, birthday party, corporate event or a large event this is unbelievable close up magic at it's very best. Restaurant work it also very popular. Steve is a member of the world known and prestigious Magic Circle. With a great personality he is the magician that everyone loves. Phone 07719 261147 for more details. Based in Bedfordshire Adrian will make your party, wedding or event simply unforgettable. Carl is a young, energetic, full time professional entertainer. Established as one of the United Kingdom's favorite Children's entertainers, Carls dedication to performing makes for an unforgettable, entertaining, fun magic show. Approved by the world famous Magic Circle, The International Brotherhood of Magicians and Equity Performing Arts. Public Liability insured for your peace of mind. 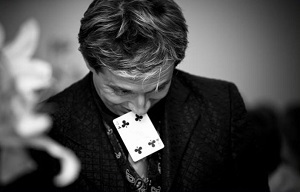 Award winning magician, Carl Charlesworth is a professional full-time entertainer. Established as one of Britain's Leading Magicians, Carl’s dedication to the art is what makes his magic so outstanding and unforgettable. 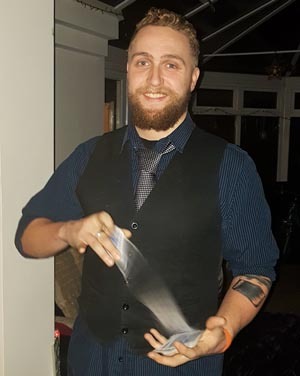 Lewis Joss is a Full-time Professional Magician/Entertainer who performs at many different events across the UK and abroad. As a Member of The Magic Circle and Equity, Lewis has been seen by thousands and is highly rated by many. Lewis started performing magic at the early age of 6 after being taught a few tricks from his Grandad, he then became very interested in magic and used to ask for magic box sets for Christmas. Lewis then began performing magic to family and friends. At the age of 10 Lewis joined The Magic Circle Youth Initiative. This is where Lewis perfected his craft. Many years later, with the experience from hundreds of shows up his sleeve, Lewis now gets booked regularly to perform at places from the Royal Air Force Club & Hyde Park in London, to Malta. Lewis is now a member of The Magic Circle and he teaches younger magicians how to perform. So far in Lewis' magic career he has worked on T.V productions with Paul Daniels and Debbie McGee, taken part in T.V adverts for Channel 5's remake of Minder with Shane Richie. Through Lewis' magic career, he has had the honour to meet and greet with the likes of Dynamo, Derren Brown, Barry & Stuart, Young and Strange, R Paul Wilson, Ali Bongo, Marvin Berglas (Creator of Marvin's Magic), Carl Froch and Rowan Atkinson. Dave Allen Multi award winning Close up , Cabaret , and stage comedy magician and ventriloquist.